Long, hot summer drawing to an end in the farrier world. 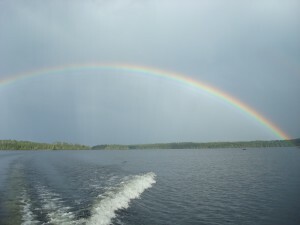 O'Sullivan Lake is famous for phenomenal rainbows and excellent fishing. It’s been a long, hot summer for much of the American market this year with only slight relief even as September begins. No one suffers more from this kind of stifling heat than the farrier in his effort to keep his clients happy and his horses sound in the summer time. However, Labor Day weekend is here and some of us decided it’s just about a perfect time to make our escape from the heat- and head north to O’Sullivan Lake near Nakina, Ontario. 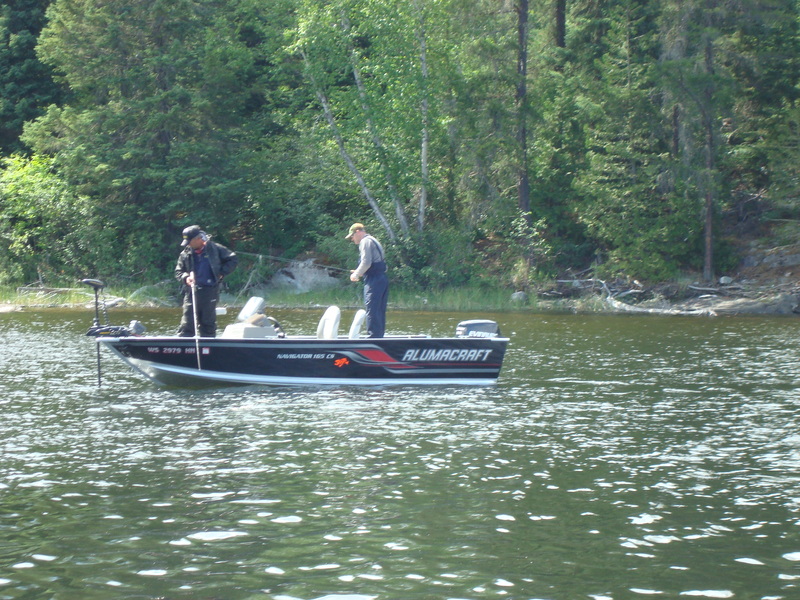 Led by our walleye mentor, Roy Bloom from Wisconsin and a ringer (serious fisherman of all freshwater species) Doug Workman from Georgia, we will put the unrelenting heat behind- expecting to bask in the cool days and nights as northwest Ontario’s fall season comies in. Roy Bloom putting them right on the fish. OK, it’s probably a well known fact that Dave Farley will be bundled up like it’s winter in the Arctic- but he’ll tough it out, I’m sure of that. 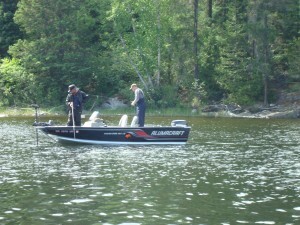 We expect to be fishing in deeper water- 25-30ft, off the points and structure that’s everywhere in O’Sullivan Lake. Look for tall tales of big fish when we get back. Part of the attraction of going this far north is the escape from cell phones and other ties to our everyday work world. I’ll be sure to get to any blog comments as soon as we get back to civilization. The farrier world will go on without missing a step, of that I’m certain. This entry was posted in On the Road, People, Walleye Fishing Places and tagged farriers, fishing, lake, o'sullivan. Bookmark the permalink. 3 Responses to Long, hot summer drawing to an end in the farrier world. oh darn! i missed the fishin’?!?!? You did Mike and it was most excellent! how about some pics of your haul?!?! ?